Laura Pensar of Moth & Candle is coming to Oracle July 13th (Friday!) to teach us about the traditions of Tarot and how you can learn to do readings with a regular ol’ playing card deck! We will learn a little about the history of playing cards, a few of the different systems used for cartomancy (the art of reading cards), and do practice readings together! 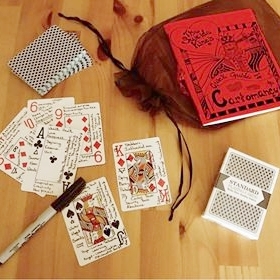 Everyone will take home a little bag with a wide-bordered deck of cards, a fine point sharpie, and a booklet with keyword meanings for about four different systems of reading cards to create your own study deck! Time to go All In!